Have you ever wondered why trees shed leaves before winters? Shedding leaves helps trees to conserve water and energy to survive. Well, that is what our bodies do if our diet is not right. They shed hair first because hair is a non-essential part of your body – meaning it’s not necessary for your survival. To save the body’s resources, nutrients will be taken from less important areas such as hair and nails to feed the more important parts, such as the brain, heart, and other organs. As a result, your hair will grow weaker and thinner over time. The good news is that if you start eating fresh, healthy foods, your body will have enough resources (nutrients); and thus your hair will get the required vitamin and minerals for it to grow strong and healthy. So what do you eat for healthy hair? Here’s a list of 7 superfoods to nourish your hair from the inside out. Who would have thought that easy to get and inexpensive vegetable like cucumber can help grow thick hair? Cucumber is chock-full of phytonutrients that not only protect hair from damage and thinning, but also propel hair growth. 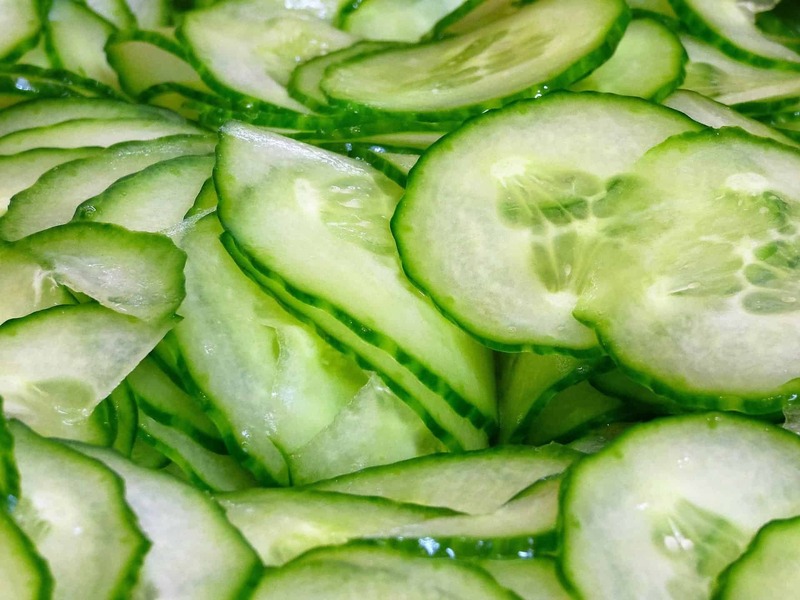 Even from the ayurvedic point of view, cucumbers are great for your hair. It reduces excess body heat or pitta dosha. As we saw here, high pitta dosha is damaging to hair follicles. Tip: Silica is present in the skin of the cucumber, so don’t peel it off. Flaxseeds are another superfoods for your hair. They are the richest vegetable source of omega-3 fatty acids called ALA (Alpha-linolenic acid). These essential fatty acids work as a natural hair conditioner and add lustre and flexibility to hair – so you will have less breakage. They also nourish your hair follicles and moisturise your scalp skin. Dry, flaky scalp is often attributed to lack of omega-3 in the diet. 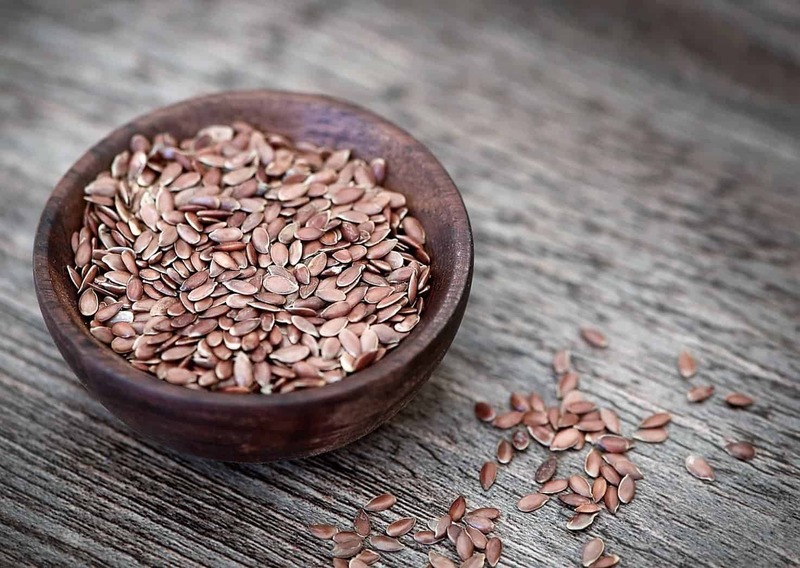 Flaxseeds contain several B vitamins, and minerals such as copper, manganese, magnesium and selenium. All help keep hair strong, healthy and, most importantly, you will find far less hairs in the shower. Did you know Linen is a textile made from the fibers of the flax plant. Chick chick chicken…is good for hair. 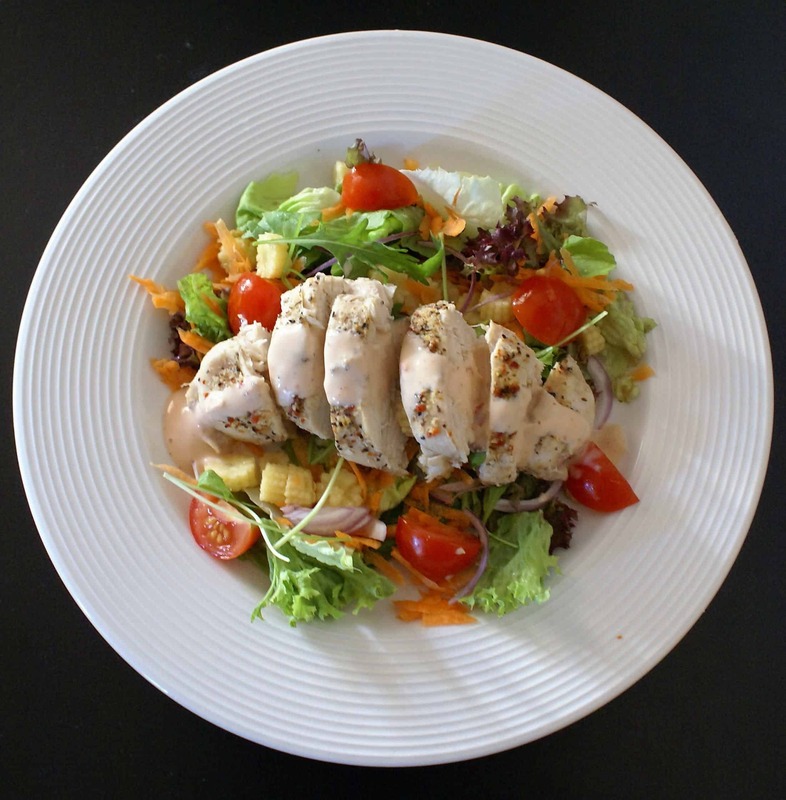 Chicken contains a special type of amino acid called ‘cysteine’ which is vital for healthy hair growth. Why is cysteine vital for hair? 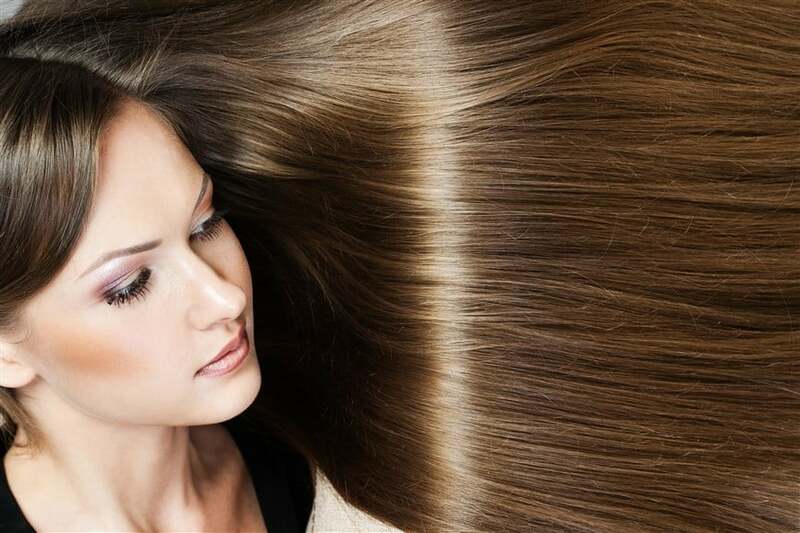 As you know, our hair is composed of a protein called keratin. And the keratin itself is built largely by cysteine. Cysteine molecules are joined together in a strong bond, which gives your hair its structure and strength. So by eating foods rich in cysteine, you can help make your hair stronger. Cysteine also promotes faster hair growth as well as improves the overall health of hair (and nails). If you are a vegetarian, there are more sources of cysteine: onion, garlic, dairy, sprouted lentils, wheat germ and oats. Just for fun: Did you know chickens don’t pee. It’s just mixed into the poop. Carrots are known to be good for eyes, but carrots also help keep your hair in tip-top condition. Carrots contain beta-carotene, which has many amazing benefits for your hair. Firstly, it protects your hair from UV-rays, pollutants and free radicals generated due to stress. Secondly, it helps in the production of sebum or your hair’s natural oils. These natural oils will give you soft, shiny, bouncy hair without any need of hair product. 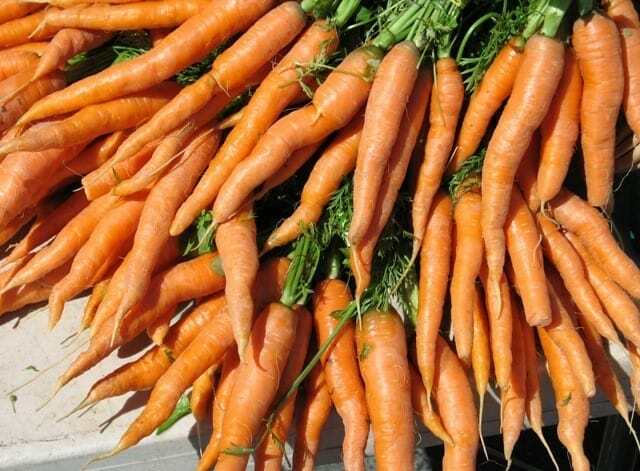 In addition, a cupful of carrot is an excellent source of biotin, vitamin K, pantothenic acid, B6 and fiber. Other high-beta-carotene foods: The orange and yellow coloured vegetables like sweet potato, papaya, pumpkin, mango, spinach and cantaloupe. 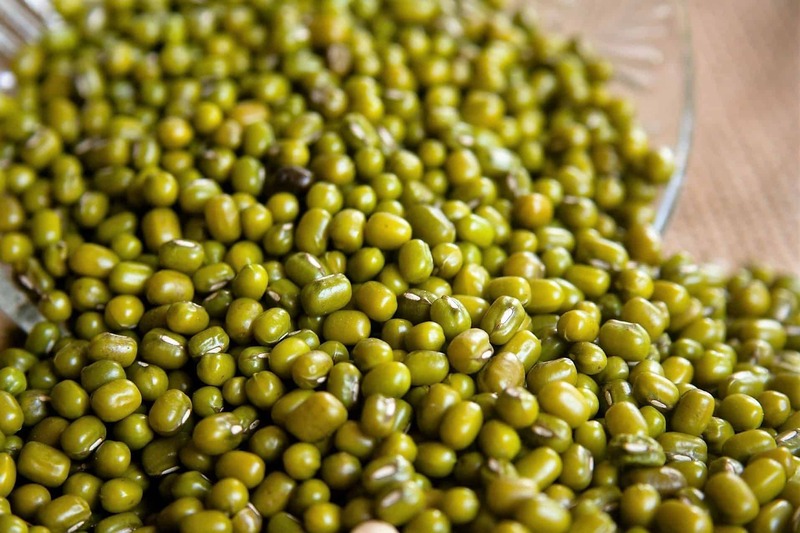 When I was growing up, mung beans were a breakfast staple in my house. So my love for this bean is very special. Mung beans contain plenty of hair nourishing nutrients such as: protein, B vitamins, zinc, iron magnesium, calcium and more. You can call them multivitamin for hair. Folate, one of the B vitamins, is found in large amounts in these beans. It helps to prevent premature greying and also restores luster and vitality of the hair. Another important nutrient worth mentioning is zinc. Zinc is vital for cell regeneration (including hair cells), and protein absorption and these function are essential to thick, healthy, shiny hair. How to eat: you can sprout them and add them to your stir-fries. Or soak them overnight and make mung soup. Almonds not only taste delicious, they also promote healthy hair. Almonds are rich in vitamin E. This powerful vitamin nourishes the scalp and gives your hair a strong base to grow. Almonds are a good source of biotin. Lately, there’s been a lot of buzz about biotin, which is touted as the important vitamin for healthy hair. Besides, if you think you are greying too early then eat almonds. They contain catalase, a special enzyme that aids to keep our hair colour pigment intact. Soak them overnight, throw away the water, rinse and eat. This helps to remove the unwanted anti-nutrients that can cause indigestion or hamper nutrition absorption. 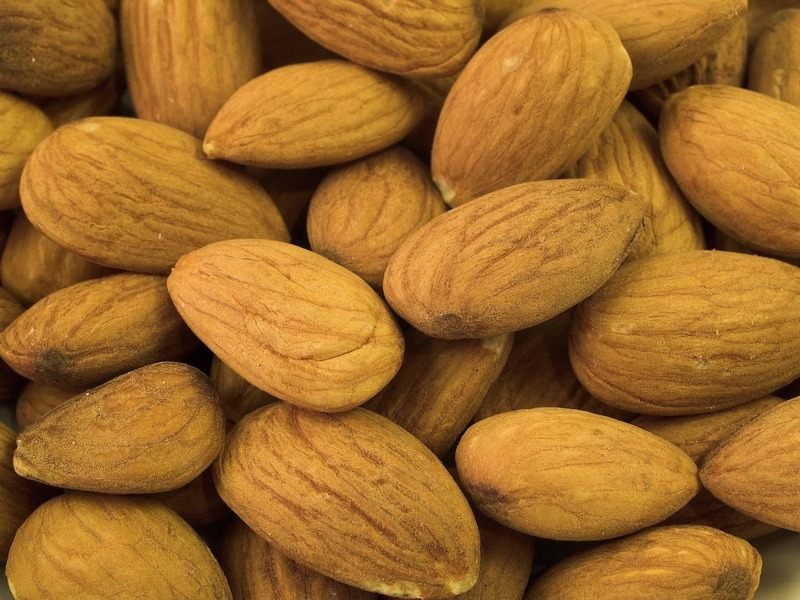 Buying Tip: Always buy organic almonds, which are free form pesticides. Amla is amazing. It has been used to grow, thick beautiful hair for centuries. Whether you eat it or put its juice on your hair, amla will not disappoint you. 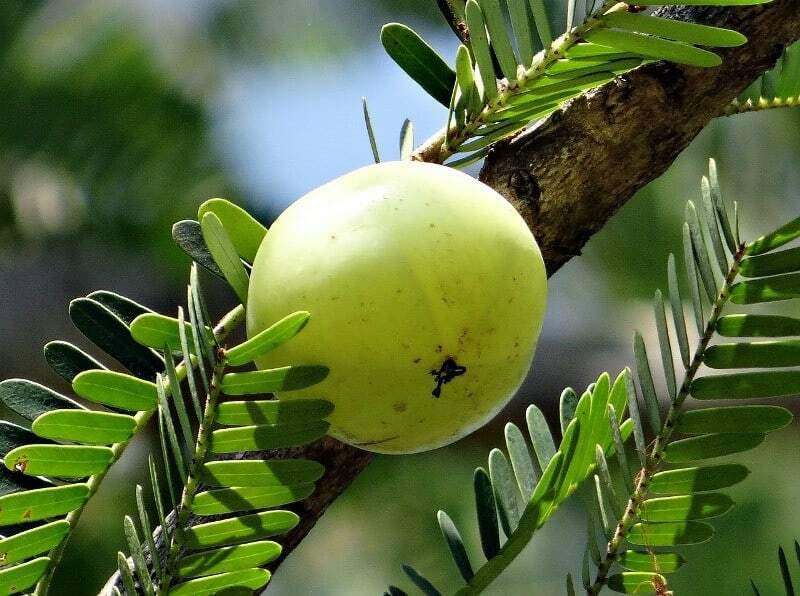 The powerful antioxidants and vitamin C in amla rejuvenate hair follicles and reduce hair loss. Amla may be able to stimulate dormant hair follicles and increase the overall thickness and density of your hair. Buying tip: You can get fresh amla when in season, or you can purchase amla powder, which is said to be equally beneficial, year around (Buy Here). I can’t stress enough on how important it is to eat fresh vegetables with every meal. All vegetables are an outstanding source of antioxidants — which protect your hair from damage and falling out. When you cook your own food, you have control over what goes into it. You can prepare a balanced diet and keep yourself and your family healthy and full of energy. If you don’t know cooking, teach yourself by taking a class or learning from friends and family. You can also take help from a nutritionist. Someone who lives in your city may be able to help you better as she/he knows what grows locally and changes seasonally. I am not saying you totally give up the fries and candies and become a monk. You can follow the 80/20 rule, so eat fresh and healthy 80% of the time and indulge 20% (not the other way). In general, a diverse diet of fruits, vegetables, healthy fats, whole grains, beans, legumes, dairy, (and some fish and meat) is the key to healthier hair. A sudden weight loss can cause shock to your body and trigger a hair loss condition called as telogen effluvium (TE). If you are losing weight by starving, you are depriving your body of essential nutrition, leading to mineral and vitamin deficiency. Like I said before, seek help from nutritionist or physical trainer if you are unsure on how to lose weight, don’t try to figure it out on your own. Sugar is empty calories, so it provides no nutritional benefits. Not just that, it actually uses up nutrients in the body to process and digest itself. Refined carbs such as white bread, naan, pasta have a similar effect as sugar. Replace refined carbs with whole grains, and sugar with healthier alternatives such as jaggery (gur). If you have dry, brittle hair, or a dry or flaky scalp, it’s a sign that you are low in essential fatty acids. All fat is not bad. Fried foods, refined oils, hydrogenated oils are examples of bad fats. Some examples of good fats are: ghee, butter, coconut, nuts (cashew, walnut), seeds (sesame, sunflower, pumpkin), avocados and fish. Again, hair loss or prematurely greying could be due to low vitamin B12. The deficiency is more common in vegans or vegetarians, as b12 is mostly found in animal products such as dairy, eggs, meat and fish. Iron deficiency anemia is one of the most common causes of thinning or hair loss in otherwise healthy women. Besides, it’s noted that women with alopecia areata have significantly lower levels of iron in their blood compared to those without hair loss. Foods rich in iron are: all beans and lentils, pumpkin seeds, sesame seeds, green leafy vegetables, beetroot, meat and liver. What do you eat to grow your hair thicker? I have Lupus SLE and Drs’ put everything that goes wrong with me, down to that. I used to have such lovely hair even though its fine hair i had loads of it. Now i have wide parting and the grey hair makes it look even worse. I feel that my confidence to go out has gone. In the sun you can see gaps. Please help Minaz. I’ve thought of seeing a Tricologist but cant find one with good reviews. I need help. Hi Sindy, I am not sure if I can help much. Keep your diet clean, eat lots of fresh vegetables and fruits. Vegetables in every meal (btw potato and paneer are not counted as vegetables). Get help from nutritionist if you are not sure on what to eat. Exercise regularly. Do a balance of cardio and weights. Exercise helps rewire our brain, balance our hormones and built healthy immune system. For hair, I have shared lots of ayurvedic masks and shampoos and they do help strengthen the hair follicles and grow healthy hair. You can start with this shampoo. Is it ok to use Banjara’s henna? or what kind of henna can we use to cover the gray. I have been coloring but i no longer want to color my hair and want to go with natural products. Please suggest on grey coverage. I have never used Banjara’s henna. Find a local supplier that sells rajasthani henna with no additives. Just pure henna powder. Hii i have moved to USA from INDIA recently its been two months since ive been here i have lost almost 1/4 of hair, i thought it because of hard water here could you plz tell me how to stop my hairfall and regrow naturally Iam very much concerned about my hairloss. Your hair loss is more probably because of the stress than hard water. Hair is very sensitive to your psychological well-being and moving (especially to a different continent) is one of the biggest stressors in ones life. The good news is, the hair can grow back. And fairly quickly as well. Do a hair mask once a week from organic Amla, Shikakai and Ritha (the brand name I use and trust is Radico), keep it on your head for one hour and rise it off. It also works as shampoo. In fact, I ditched the regular shampoo and only use Shikakai and Ritha as a shampoo.You should start seeing new hair growth in 4 to 6 weeks. Hi Sally, my mom made a stir-fry with onion, tomato, some turmeric and chili powder. I like your holistic approach. Everything is interconnected and you bring it out so eloquently. It makes me feel even better to eat what I already eat i.e. natural foods as you explain it helps me scientifically. My grandmother used to say eat what god has given you the way he is given it to you and you will avoid 90% of problems. Thanks for sharing this. ….. What you eat shows in your hair and skin. Hi Minaz, Great post as always. I am trying to all these protein rich foods for thicker hair. As I mentioned in one of my comments, I smoothened by hair. Hair loss is bit more after I started with hair massage. As per your suggestion, I stopped the parlor head massage and started my own for 10min 3times a week. I was just thinking should I start with some vitamin supplements. Do you have any suggestions on that. It took few months to normalise my hair fall. The chemical treatment that you had could have affected your hair follicle health and it takes time to recover. Also, do you think you could be deficient in iron, calcium, B12, or vitamin D? Their low levels cause hair loss. I would suggest that you consult a doctor and find out what is truly causing hair loss. Let me know how it goes. What oil are you using for head massage? Hi Minaz, I am using coconut oil mixed with aloe vera oil and another homemade oil which I bought online. I heat the oil and apply(not sure of ingredients..it worked for my friend so I got it). Now that you asked me this question, I am just thinking is it the hair oil that is causing my hairloss. I never had the history of iron,calcium deficiency. From past few months in fact, after I started taking good care of my hair is when I am seeing more hairloss. I am just going with the hope that all weak hair is falling. its more than a month I started head massage. Also I do apply coconut milk mixed with 5 drops of lavender essential oil and leave it for 1hr. During this one hour I go to gym class within my apartment. Started washing my hair with homemade Reetha shampoo. Hi Suja, just use any one oil (may be coconut). And don’t heat the oil, not good for hair loss. You can try this Miracle Hair Mask. And/or this egg mask. Sure Minaz! Will try the Miracle Hair Mask. Thanks Minaz, this is good. I’m losing thickness in my hair and hair has really become scarce around the middle of my head. One of my thoughts is to completely move away from commercial shampoos and conditioners- and only use amla and shikakai as a paste thrice weekly, followed by applying hair oil thrice weekly. Wonder how that sounds to you. Sounds good. Also add fenugreek powder to your shikakai and amla paste. Fenugreek helps to reduce hair loss and is good for your scalp health.